The TPP3 board features 14 x "M" and (14+1) x "C" sockets. Sockets (S1) ~ (S28) form 7 standard tiles. •Socket (S23) only has control lines A and B. Control lines C and D are not implemented. •Socket (S25) only has the control line A. Control lines B, C, and D are not implemented. •Socket (S27) has no control lines connected to it. •Remaining "M" sockets have all four control lines implemented. •"M" sockets (S1), (S5), (S9), and (S13) have the UART capability. •"M" sockets (S1), (S3), (S5), (S7), (S9), (S11), (S13), and (S15) have the interrupt capability. •"M" socket (S27) has the PoE capability, provided that four TPP2 jumpers are set to 2-3 position (see below). 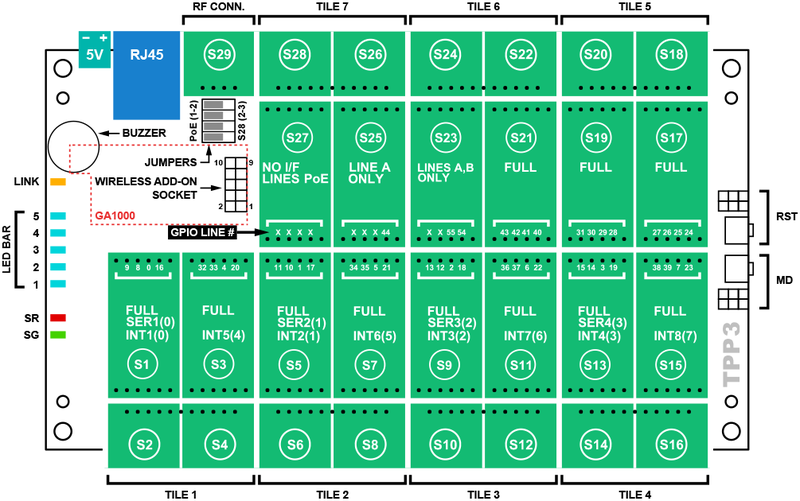 •"C" socket (S29) exists exclusively for the installation of the RF connector Tibbit #37. This socket has no other functions. •When the jumpers are in the 1-2 position, four power lines from the RJ45 jack are connected to four I/O lines of (S27). Under this arrangement you can install an M1 PoE device into the (S27), or M2 PoE device into the (S25)-(S27). •When the jumpers are in the 2-3 position, the RJ45 jack is disconnected from the socket (S27). The socket (S27) is instead connected to (S28) in a "standard tile way".